Bread: Mix 4 cups bread flour and next 3 ingredients in large bowl of heavy-duty stand mixer fitted with paddle attachment. Warm 1 cup plus 2 tablespoons water and buttermilk in small saucepan over low heat just until instant-read thermometer inserted into mixture registers 95°F. 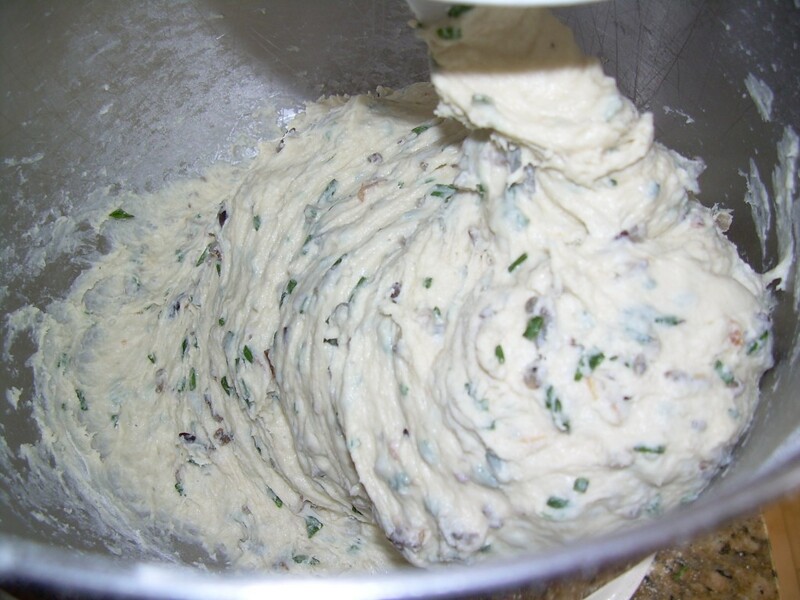 Add cooked wild rice and chives to flour mixture; add kefir mixture. Mix on low speed until dough forms coarse ball, about 2 minutes. Let dough rest in mixer 5 minutes. Replace paddle attachment on mixer with dough hook. Mix dough until smooth, elastic, and slightly tacky but not sticky, adding more flour by tablespoonfuls as needed, about 4 minutes. Lightly oil large bowl. Shape dough into ball; place in prepared bowl, turning to coat with oil. Cover with plastic wrap and refrigerate overnight (dough will rise very slowly; do not punch dough down). Let dough rise, covered, in draft-free area at room temperature 1 1/2 to 2 hours before shaping (dough may not double). Line large rimmed baking sheet with parchment paper. Transfer dough to floured surface; divide into 2 equal pieces. Roll out each dough piece to 8×6-inch rectangle. Starting at 1 long side, roll up each rectangle to resemble torpedo. Use fingers to pinch seam closed and taper ends by rolling each loaf back and forth on work surface, forming bâtardes about 11 inches long. Transfer to prepared baking sheet, spacing 4 inches apart; spray with nonstick spray. Cover loosely with plastic wrap. 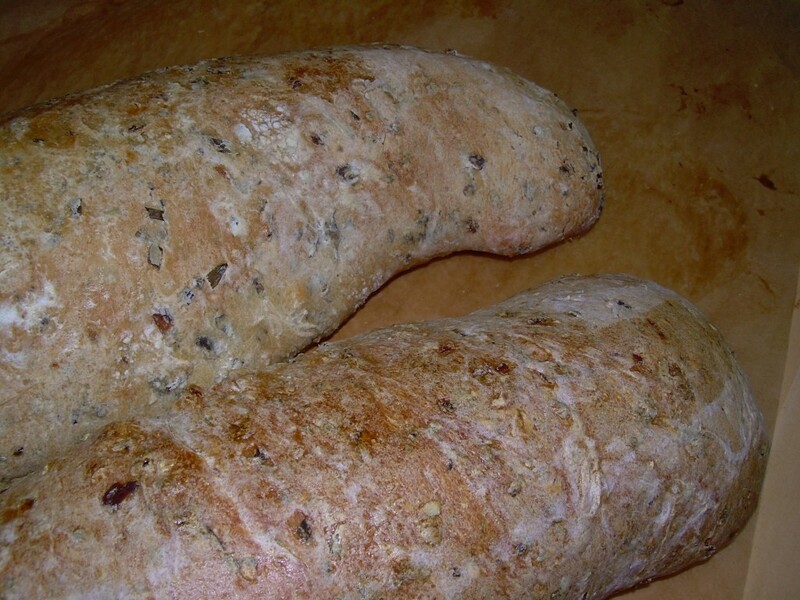 Let loaves rise in warm draft-free area until almost doubled in volume, 1 to 1 1/2 hours. Position rack in center of oven; preheat to 450°F. Brush loaves with egg glaze; place in oven. Reduce oven temperature to 425°F. Bake until loaves are puffed and lightly browned, and sound hollow when tapped on bottom, 35 to 45 minutes. Transfer loaves to rack; cool at least 1 hour. DO AHEAD: Cool loaves completely. Wrap in foil, then enclose in resealable plastic bag and freeze up to 2 weeks. Thaw at room temperature. If desired, rewarm loaves wrapped in foil in 350°F oven about 15 minutes. Cut loaves crosswise into slices. Looks delicious. I remember that Thanksgiving issue of Bon Appetit–there were a few yummy sounding recipes from Peter Reinhart. I have to go back now and look again. What an interesting recipe,wild rice and chives!This is definitely going in my to do list.Hope you won’t mind I’d really love to guide Foodista readers to this post.Just add the foodista widget to the end of this post and it’s all set, Thanks! I have got to try these. They look fantstic.